Embroidery, Baking and Painting. Its a Trifecta of Crafting! It has been a rough week for me, so this will be a quick post. 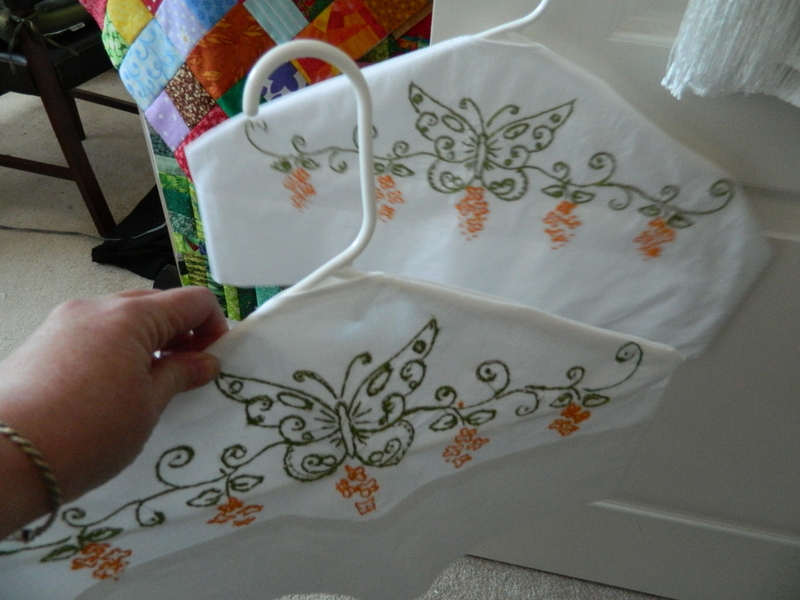 In honor of my Mother who passed away this past week, I finished some hanger covers that I had stamped and marked and my Mom had embroidered for me. 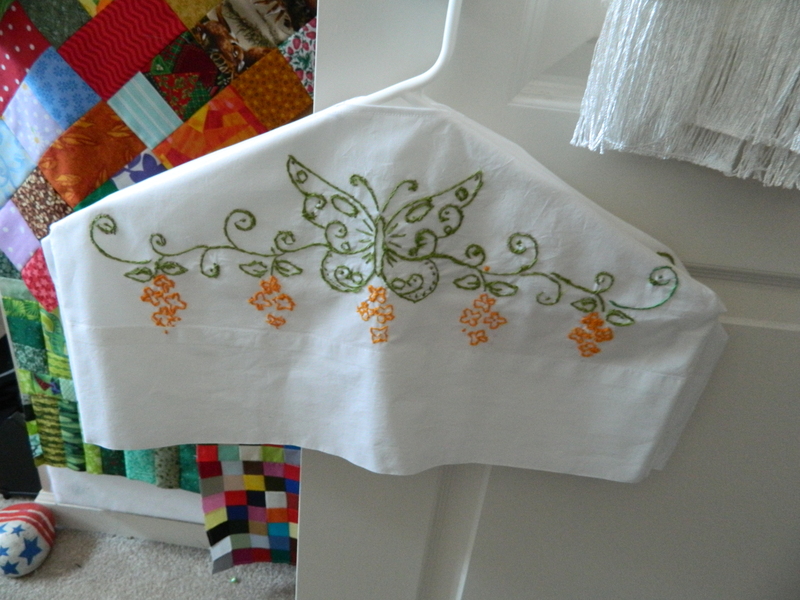 She had been a big embroiderer when I was young and she did teach me how at that time. I did a few pieces when I was young, not sure any had really survived. I’ve occasionally picked up a piece from time to time, but never have been accomplished at it. Mostly just did accents on pieces. I bought a lovely sewing machine from Singer that now does it automatically and I could never compete – time or accuracy – with its results. I think they turned out quite charming. I think that I will hang one on the front of my closet door in my bathroom and the other will hang in the quest room. Another thing I did differently was to do some baking this week. Nothing like rich, gooey, calorie laden baked goods to make the family feel better and bond me with my son. And he loved this! And it was so simple to do, I don’t know why I hadn’t done it sooner or do it more often. 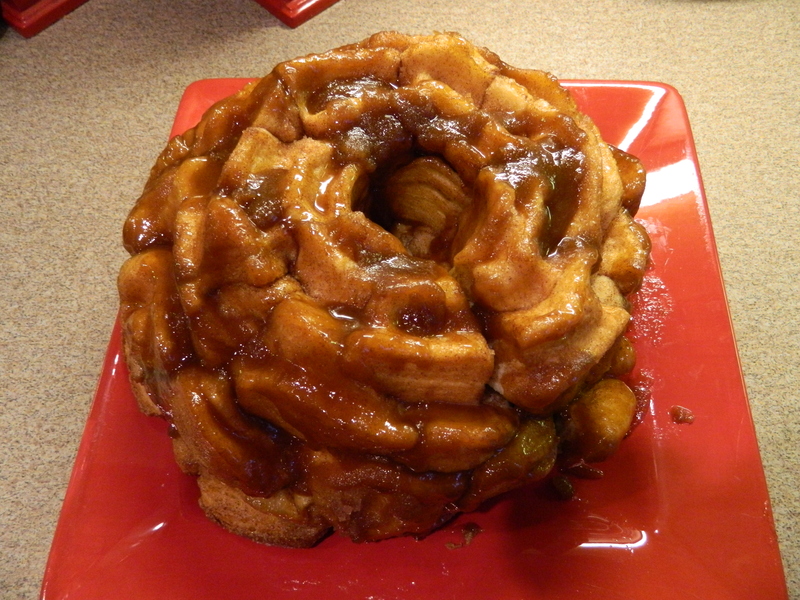 It is called Monkeybread and this recipe was made using Pillsbury refrigerated dough for buttermilk biscuits. This was so unbelievably good, especially warm! It was gone before the day’s end. 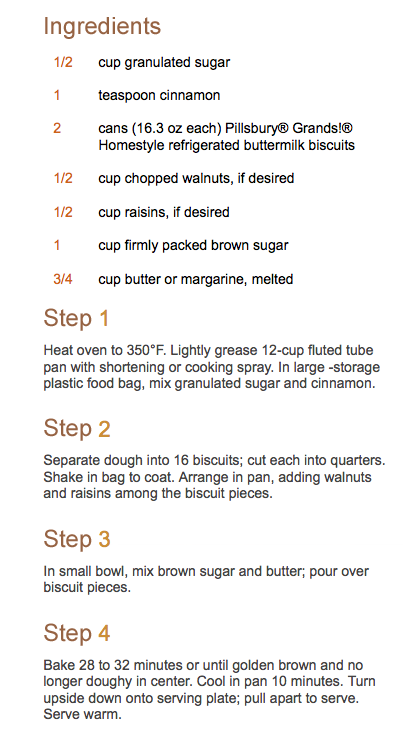 And so simple to make… you should try it! 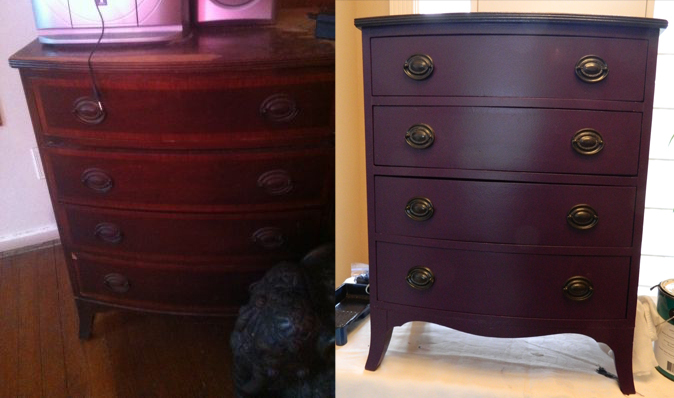 Last but not least, this simple transformation of a beautiful little piece. It was very beautiful, but the top’s veneer was seriously damaged. I spent a few hours and a hammer and a pry tool and managed to remove it all without damaging the base piece. This allowed me to then prime the entire piece and generously applied six coats of my favorite black paint to the top. the remainder of the cabinet was the recipient of this beautiful dark purple that leans toward red when wet, but blue when dry so it just looks so extraordinary with the black that has undertones of blue as well. I cleaned and then spray painted the hardware that was original to the piece, they were quite stunning in their own right. Not often do I re-use the original hardware, usually it is those ubiquitous Chippendale style handles that I have come to really dislike quite intensely. But with a couple of carefully applied coats of metallic black, these handles just turned out fabulously. Much to do this week and I have the luxury of having the Kid home with me on Spring Break. So far, “spring” has been cold, cloudy and a bit precipitous. The Kid has voiced his desire to transform a dresser from start to finish… I am excited and trying to convince myself that he wants to learn the process but I know he is doing it so that he can take a bigger cut of the profit! Either way, I get his company and help and that is worth it all! Thank you for dropping by. And keep up the crafting! I’m sorry about your mother. I think Heaven must have been in need of another brilliant woman. Best wishes, I love your blog.